Petrolheads, big kids and toy car fans will love the new 69p Squash My Car app for iPhone and Android devices, released on 23rd January 2012. The brainchild of Stephen Holmes and Chris Kessling, childhood friends and avowed pistonheads, it’s a quirky app that takes a picture of any real life car and transforms it into a squashed, toy racer version. The images will raise a laugh amongst car owners and car fans, who will recognise the distinctive features of their motor compressed into a toy car format. The app makes it easy to share the pictures using email, picture messages, Facebook, Twitter, and other social networking sites. No vehicle is safe: from Clarkson’s Mercedes to Jay Kay’s Porsche collection, celebrities can see their prestige cars squashed down to size. Ordinary family cars take on a whole new personality with a pint-sized Squash My Car restyle. Minimise your Mini, shrink your Subaru, condense your Chrysler or abridge your Aston Martin – the app works for any make, model or vintage. The app uses complex photo manipulation tools to alter the original photo of any car. The joy of the resulting images is that they retain their distinguishing features and are recognisable as the original car… from a whole new perspective. “We’re looking forward to seeing the pictures that app users come up with,” Chris Kessling adds. 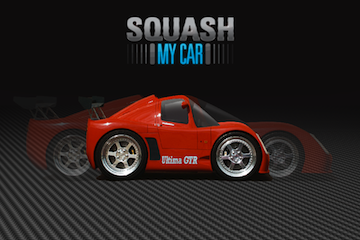 They hope to bring some fun to the Twitter community by launching a #squashmycar hashtag so everyone can share their best shots – whether of their own car or a most loved or hated celebrity vehicle or classic marque. Or add your picture to the app’s Facebook page and get access to exclusive updates and giveaways. Watch the video on Youtube to see what you can do!! This press release was distributed by ResponseSource Press Release Wire on behalf of RRVA Creative Flow Solutions in the following categories: Men's Interest, Motoring, Computing & Telecoms, for more information visit https://pressreleasewire.responsesource.com/about.